Only two more to go in this series of reviews and tonight I took on the El Triunfador #2 from Pete Johnson. The #2 boasts the largest ring gauge in the El Triunfador line and is the only stick to have a torpedo shaped head. I like torpedo vitolas because I always seem to get a better cut than on a standard round-headed cigar. I'm not sure why, it just seems to be that way. Again, this review is sponsored by New Havana Cigars. 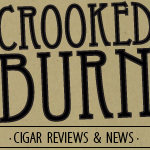 If you have not already, please visit the site and tell him Crooked Burn sent you. My El Triunfador #2 had a perfectly solid chocolate brown wrapper that may be the smoothest I have seen within the line. The cigar did a have few small veins and one bigger vein leading to the cap, but they were nicely smoothed down and I figured wouldn't cause any burn issues. Being the biggest in ring gauge of the bunch, the El Triunfador #2 felt much heavier in the hand than the other vitolas. When pinched from the head to the foot, the cigar was well-packed with no soft spots. The pre-lit aroma was faint, but from what I could pick up, it smelled like natural aged tobacco. After easily clipping the head, the cold draw was free but tasteless. The normal torch I use to light cigars with was out of gas, so I lit my El Triunfador #2 with some matches laying around the smoking lounge. Even with this larger ring gauge, and me without my torch, the cigar lit very easily and immediately started producing thick clouds of smoke. The burn was as perfect as can be and the ash held solid for just over an inch. The initial flavors from the El Triunfador were similar to most of the sticks in the line, with an initial blast of white pepper followed by a deep woodiness. (note: I have still yet to get that cedar taste like I got in the #3 in any of the other vitolas.) The thing I liked about this cigar over a few of the others (if you have read the review series you know which ones), was that the flavor profile seemed to be back to that strong point where I could really taste what was going on. Toward the end of the first third, the white pepper faded and I was left with just a rich woody taste. The second third pretty much smoked all the way through how the first third ended. The only real flavor that was coming through was the stong wood taste. At one point the smoke got a little bitter on me, but that only lasted two or three puffs before we were back to that nice creamy texture. I do think that during the second third, the body of my El Triunfador #2 picked up almost into the med-full range. This was a difference from all of the other El Triunfadors I had smoked, which never came close to reaching that strength. The burn, again, was perfection. The final third of my El Triunfador #2 started with something unexpected. After the second third, I was fairly certain this cigar was going to finish up the way it had been going. I knew I was wrong when I started tasting some peppermint and a stronger natural tobacco taste. These flavors came on so strong that the woodsiness almost completely dissipated. I was shocked and pleased, to say the least, at the turn of flavors. Getting closer to the nub, the cigar started to get a little hot and the woodsiness started to creep back in, but I would still say the dominating flavors were peppermint and natural tobacco. Getting even closer to the nub, the cigar became to hot and harsh, so I had to put it down. During the final third, the body of the cigar also went back more into a medium range than a medium-full. Maybe there was something in the middle of the stick that caused those few harsh puffs that also strengthened the smoke? Who knows. Final thoughts: Note to anyone who smokes the El Triunfador #2. Do not give up on this stick to early. I found the final third of the cigar to be the most interesting. I still don't think this is my favorite of the El Triunfador line, but it is in the upper half at this point.